Pharmacists, grocers, and many others sold immensely popular patent medicines during the nineteenth century. Premixed patent medicines came with instruction for use and often advertised that they did not contain chemicals commonly used in prescription medications. Neither the United States nor the State of New York had any laws regulating the creation or sale of patent medicines. 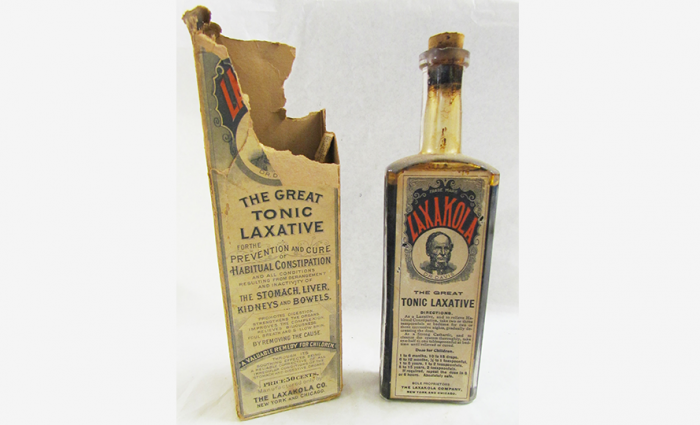 Patent Medicine, 19th Century, The Laxacola Co., glass and paper, H: 7 x L: 2.25 x W:1.25in. The Farmers’ Museum, Cooperstown, New York, gift of Mrs. Munro, F0159.1944.